Author: Mirza Tahir Ahmad ra, 4th Caliph of Ahmadiyya Muslim Community. Description: Any divide between revelation and rationality, religion and logic has to be irrational. If religion and rationality cannot proceed hand in hand, there has to be something deeply wrong with either of the two. Does revelation play any vital role in human affairs? Is not rationality sufficient to guide man in all the problems which confront him? Numerous questions such as these are examined with minute attention. WASHINGTON: Pakistan plans within this year to revise its laws against blasphemy, which have long been criticised as a way to abuse minorities, a government minister said. Shahbaz Bhatti, minister for minority affairs, said religious reconciliation was a little-noticed priority for President Asif Ali Zardari’s civilian government in Pakistan, which lies on the frontline of the US-led war against extremism. Bhatti, a long-time Roman Catholic activist whose position was given full cabinet status for the first time, said he was speaking with political parties to present revisions to the blasphemy law by the end of 2010. “This is a democratic government which has a commitment to repeal all the discriminatory laws affecting the rights of minorities,” Bhatti told AFP in an interview in Washington. “We are using military action to fight terrorism and we are using economic opportunities, but another thing which is important is that we are pursuing interfaith harmony,” he said. Bhatti said that while he did not envision an immediate repeal of blasphemy laws, the revision would require judges to investigate cases before they are registered — creating oversight of the police, who are often accused of abuse. The revised law would also assign punishment equivalent to that under the blasphemy laws for anyone who makes a false complaint, he said. Bhatti was in Washington to attend the National Prayer Breakfast, an annual Christian-organised gathering drawing national leaders. He also met with US lawmakers, the US Commission on International Religious Freedom and Richard Holbrooke, the US special envoy to Afghanistan and Pakistan. Pakistan’s law against blaspheming Islam carries the death penalty. While no one has ever been sent to the gallows for the crime, activists say the law is used to exploit others out of personal enmity or business disputes. 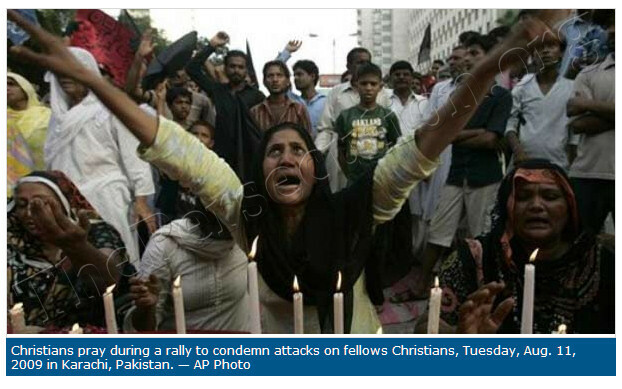 In June last year, blasphemy allegations led to mob violence against Christians in Punjab that caused hundreds to flee, according to the US State Department’s annual report on religious freedom around the world. The report said there was particular discrimination against the Ahmadiya community, which Pakistan considers non-Muslim as adherents do not believe Mohammed was the last prophet. In another incident in September, a 25-year-old Christian jailed on blasphemy allegations died in prison. Activists suspected he was tortured, but authorities said he committed suicide. Pakistan, founded in 1947 as a Muslim homeland during the bloody partition of British India, is overwhelmingly Muslim. Religious minorities however form some five per cent of the population, according to government figures. Among Muslims, strong tensions also persist between the majority Sunni and the minority Shia sects. Bombings on Friday killed 33 people in Karachi, including an attack near a bus carrying people to a Shia procession. But Bhatti vowed to make progress at home. In December, the government launched a drive to set up more than 120 “district interfaith harmony committees” around Pakistan to help resolve conflicts surrounded minorities. Bhatti said he has personally visited religious communities around the country including more than 30 madrassas, or Islamic schools, to encourage tolerance. While he said he met a positive reception, Bhatti was under no illusions about his safety, saying he has faced death threats. “When I started this struggle I said that I would not compromise on the principle of religious freedom and human equality,” he said.